Aiven PostgreSQL services are managed from Aiven web console. First login to the console with your email address and password and you will be automatically taken to the "Services" view that shows all the services of the currently selected project. To get started with Aiven PostgreSQL, first click the "Create a new service" button. Service type: Select "PostgreSQL" and please note that there are more than one PostgreSQL version available (e.g. 9.5, 9.6 or 10). Select the most appropriate version for your needs. If unsure, just go with the latest version. You can also use a graphical client like PGAdmin3 to connect. When connecting copy-paste the connection parameters from the overview page on to PGAdmin's "New Server Registration" page. 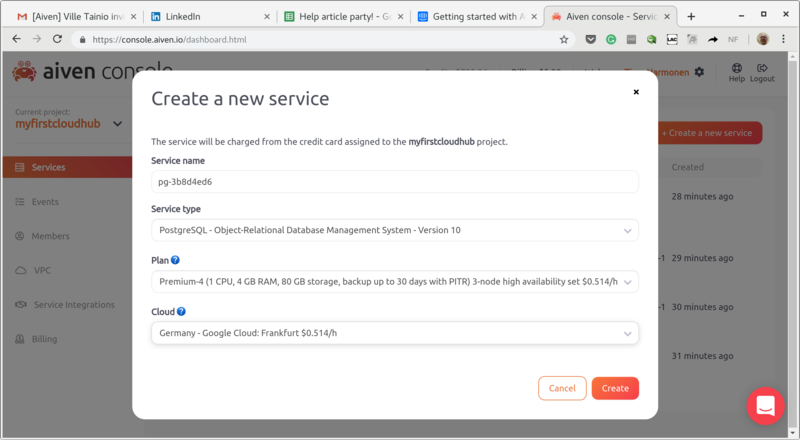 Remember to also change the name of the "maintenance database" to defaultdb in order to connect to the Aiven PostgreSQL default database. NOTE: Aiven enforces usage of SSL for PostgreSQL connections, i.e. any client connecting to an Aiven PostgreSQL is required to use SSL. If you have trouble connecting to the database, please make sure your client software is not trying to establish an insecure non-SSL connection. In order to create more databases, you can go to to the service's "Users and Databases" tab in the Aiven web console and click "Add database". Database users can be added in a similar way by clicking "Add service user" button. This Python example uses the psycopg2 library for connecting to Aiven PostgreSQL. This example uses the node-postgres library. This example uses the Sequelize library. Service CA certificate, which you can download from the Aiven console's service page by clicking the "view CA certificate" button. This C# example uses the Npgsql driver for connecting to Aiven PostgreSQL. You'll need to download the service CA certificate from the Aiven console's service page by clicking the "view CA certificate" button.